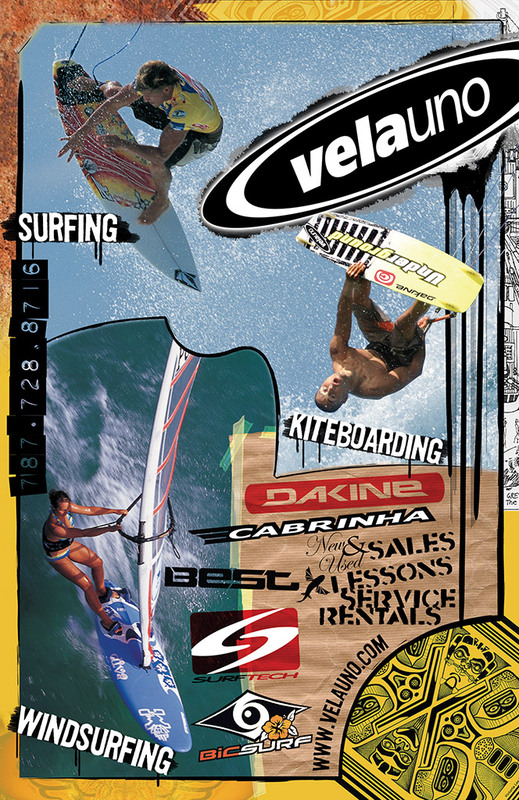 I produced this promo card for Velauno in 2007 to help promote the sale of surf, kite and windsurf products by Dakine, Bic Surf, Thule, Cabrinha, Best Kiteboarding and Surftech. The cards were printed on thick stock cover, full color on both sides. These were handed out at races, beach events, malls, and also sent out with mail orders. The success of this promo led to the creation of other similar cards soon after. 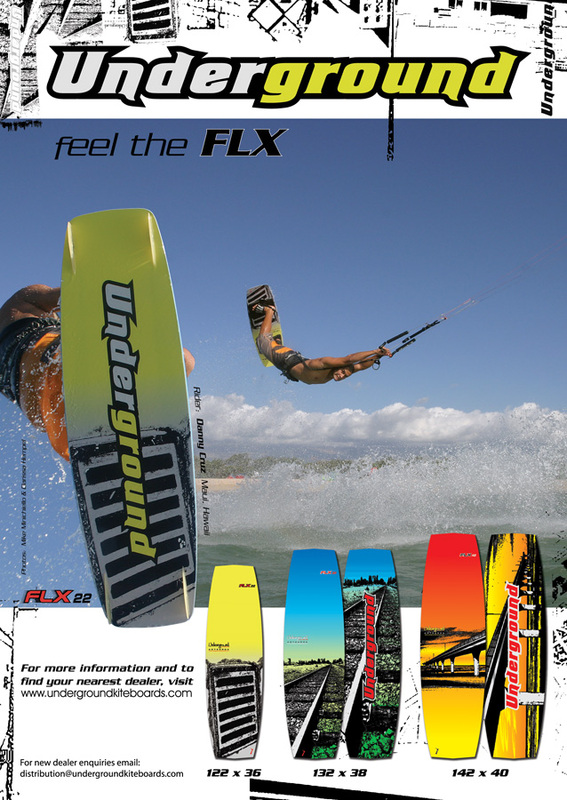 At the time I designed these, the surf industry was big into grunge art. There is a lot going on in this piece which is characterized by busy visual elements and the lack of clean straight lines. It’s a lot harder than it looks to get this style of artwork right. The thing I like most about grunge is the vast amount of possibilities. 2. To test my site photo lightbox display. For some reason, the lightbox didn’t want to work on my last post. I’m using this opportunity to see if it’ll work on this one. You don’t have to worry about this, but if you want to know more, I’m talking about the little window that shows up in front of the page when you click a photo. 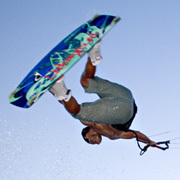 What makes this site unique (apart from all the cool kiteboarding photos and videos) is that it represents a big landmark in my development as a designer. I created all the artwork for it back in 2004 and it was mostly all done in Photoshop. While I wouldn’t design this way anymore due to the functionality limitations, I was able to prove to myself I could do something really cool and rather unique at the time. Fast forward 6 years and my development as a designer has grown exponentially. The screen capture below was taken from the video page of that old site. By the way, I just tested the lightbox and it works. I wonder what’s going on with my last post? 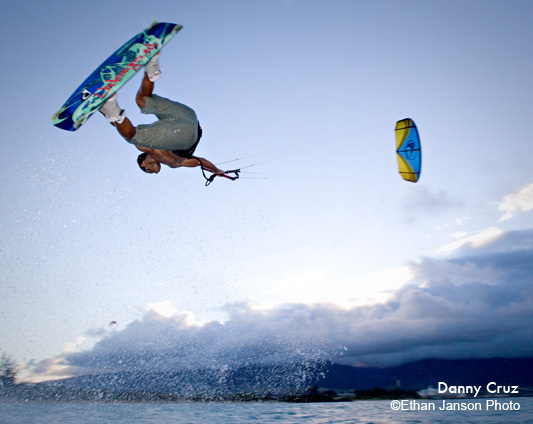 I want to talk to you about my favorite kiteboarding photo. Go ahead! Take a look. It’s the photo at the very end of this post. There’s a lot going on in that photo. So much that it deserves an entire post. There’s a lot going on in that photo. So much that it deserves an entire post. First of all, the setting. This photo was shot in Maui, Hawaii in late October 2005. At the time, I was not living on Maui. I had moved out about a year before that. I had flown to Hawaii from Puerto Rico earlier that month to spend 5 weeks training before heading to Southern California on a scouting trip. I was planning to move to SoCal the following year. I rode almost every day for 3 or 4 weeks before the day this photo was shot. Let me tell you, the best time to be on Maui for kiteboarding is the fall. The waves are epic most of the time and the wind is relentless. This fall was no exception. I spent most of the time riding waves and was a bit less focused on freestyle tricks at this point. 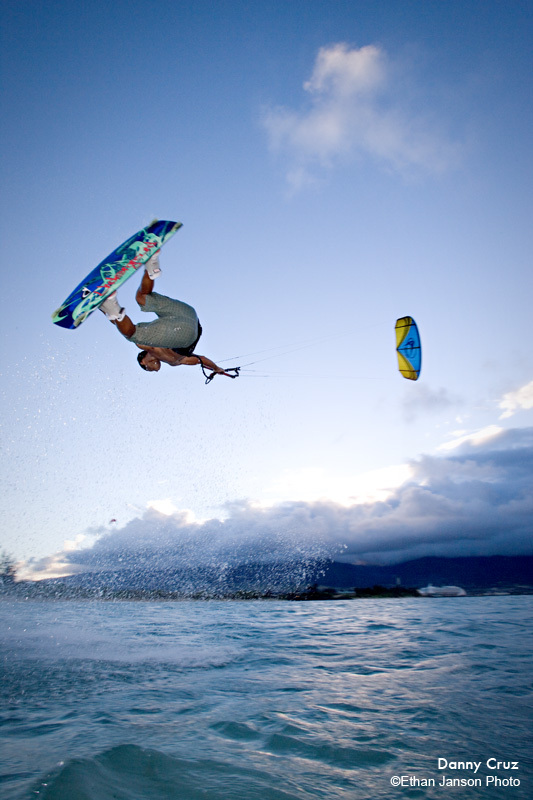 I had already “retired” from kiteboarding and was out there just to have fun and not get hurt. At Kitebeach there’s a shallow spot right in the middle. When there are waves on the outside reefs, a whole array of awesome kickers form in the inside right over this shallow bar. This provides excellent ramps that mirror a boat’s wake. These ramps are ideal for doing powered up wakestyle tricks. I don’t think there’s a better place in the world for this. On this particular session I had ridden out just before sunset. The conditions were excellent and the wind was filling the inside quite nicely at about 20 mph. The kickers on the shallows were rolling through nicely, and I was out with only 2 other kiters, non other than brothers Shawn and Jesse Richman. Keep in mind, this was back in 2005 when the Richman brothers still looked up to me as a rider. Given that now they are world renown kiteboarders and Jesse just so happened to win the world championship, now it definitely me looking up to them. …conditions were excellent and the wind was filling the inside quite nicely at about 20 mph. The 3 of us were hitting the kickers and pulling trick after trick. The evening was getting incredibly beautiful as the sun was setting behind the West Maui Mountains. Usually, the clouds over the mountains are much thicker. This renders the sunset a bit dark and somber rather than an impressive array of color. But today, the clouds were not as thick and the sunset was showing a nice deep purple color. The visibility was great. Photographer Ethan Janson from Seattle took advantage of the perfect situation. He was out at the shallows with a 16 megapixel camera and a powerful strobe light. He shot photo after photo of us doing our thing over the kickers. I still remember the second this photo was taken. The trick is called an Indy Glide and it involves jumping off a small wave while fully powered and extending your body horizontally while keeping your knees bent in order to reach and grab the center rail of the board with your trailing hand. To do the trick properly the kite must be very low in the sky and fully powered to simulate the pull of a boat. Ideally, you must also he unhooked from the kite and holding the bar near the center with only one hand. At the point this shot was taken, I had reached the apex of my jump and my trailing hand had just released the board. A second later, I pulled the board back under me, landed hot and rode away. Perfect! This was one trick I was very good at. Be sure to click the the image to see the full photo.